Coded UI is a new feature of Visual Studio 2010 that allows for UI automation à la Selenium, SilkTest, QTP etc. It fully integrates with the Application Lifecycle Management elements of Visual Studio 2010, with the bonus of being able to customize the automation using C# or VB.Net. My page over here runs through a simple example in order to explore some of the details. Fitnesse is "a simple tool that allows non-technical users to specify and run acceptance tests for software systems". In the agile testing pyramid concept, unit tests would be at the base and UI automation, like Coded UI Testing, at the top. A tool like Fitnesse can help with the middle layer, the realm of functional and acceptance tests - think something along the lines of high-level unit tests for the business side. There are tools like Selenesse that can help integrate Selenium with Fitnesse but Microsoft's Coded UI Test (CUIT) generally does not want to be run outside of the ALM framework. This article presents one possibility to enable low-level integration between CUIT and Fitnesse. Use Fitnesse to a) provide the source data for a data-driven Coded UI Test and, b) automate kickoff of the CUIT. I won't go into any real detail on the setting up of Fitnesse since there are already a number of tutorials. The one at Rapid Intro to using Slim with .Net is particularly apt since it involves Slim (Simple List Invocation Method). Slim is an alternative to using Fit, with the one major benefit being how easy it can be to set up a simple test. The examples below expect the fitSharp binaries to be located in a folder named Slim1.6, at a sibling level to main FitNesseRoot directory. As indicated by the naming convention, the version of fitSharp I'm using is 1.6, which happens to be the latest available from http://github.com/jediwhale/fitsharp/downloads as of this writing. where the TEST_SYSTEM indicates we are using slim instead of the default fit framework. The !path holds a dummy value right now, which will need to be updated once there is a test project in Visual Studio. Same as to the namespace to be imported. Save the page and put off to the side for now. 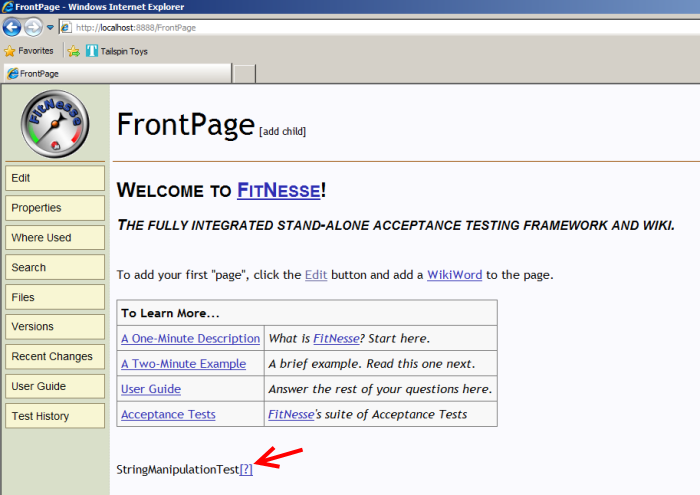 Note that because the name I gave the page ended in the text "Test" (StringManipulationTest), Fitnesse knew I was creating a test page. Otherwise, I would have needed to click Properties link on the page's left-hand menu -> set Page type to 'Test' -> and Save Properties in order for the top link to read "Test" instead of "Edit". Those methods, and the ones that represent the test oracle, (JoinTextTogether, SwapTextOrderAndJoin, and ReverseLettersInFirstPieceOfTextAndJoin) are purposefully written in a more user/business friendly manner. The person writing the tests on the Fitnesse side may not even know what a string is, and Join may be a better term than Concatenate (or not, just depends on the scenario).